I have an older brother and when I was little, I used to think he was better than me in everything. Even now, he "beats" me in many of life's contests. He cooks better than me (really does, sort of embarrassing as our parents were restaurateurs), he speaks Spanish and Korean better than me, he's read more books than me, he makes more money than me (but everyone makes more money than me)... you get the picture. So being constantly overshadowed by a big sib is nothing new to me but still, as a mom to two boys, I have set Number 2 up for the same sort of disappointment, especially in the toy section. Number 1 is a great builder and so we amassed many play sets to which you can add on more pieces such as Hot Wheels, wooden train tracks, Legos, wooden blocks, etc.. For many of these toys, they sort of sat there in our play area, never being presented to Number 2 as "this is yours now." So it should be no surprise that he would play with them only when his brother took them out and built it for him. This was a problem. Number 2 wouldn't build anything himself. He would be overwhelmed at the sight of a bin full of tracks or blocks or whatever pieces of a building toy set. You can call these "delayed play skills" and that is certainly not a good thing but what was I to do with that? So I chose to buy even more toys! I know you think that's dumb but hear me out. I chose the Hot Wheels Radical Roadway because it was easy to build. I don't think it really can be built more than one way and I would usually say that such a feature is not good for a child who needs to learn more open-ended building. However, I felt like getting an easy structure could instill confidence and familiarize him with the mechanics. Even though he had tons of tracks from his big brother including loops and launchers, none of these pieces ever came in a box to him with pictures and directions. This set would be his own beginning chapter, I hoped. At first, he struggled to build it but once he did (with help), he loved it and then after a while, as it is not an open-ended playset, he grew tired of it. As to be expected, the set also fell apart into pieces and sometimes Number 2, would build it back but after a while, the pieces would become disconnected again and Number 2's memory of how it was supposed to be hooked together became spotty. "Simple" can work for overshadowed and overwhelmed younger sibs. But during this holiday weekend when the last day can be your most boring or busiest, Number 2 had a hard time entertaining himself and while he chose to play with the Hot Wheels set, he just couldn't get past Step 1. Even though he was frustrated, I pushed him to MAKE LOTS OF MISTAKES. I realized that Number 2 stopped trying because" it wasn't right." After all, there really was only one way to build it. 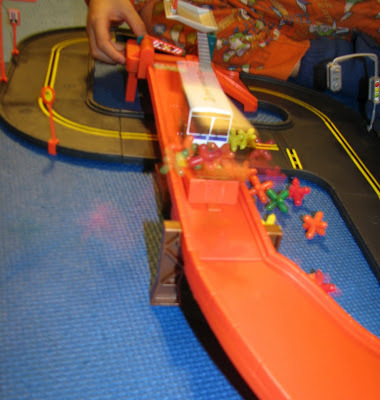 However, after a while, Number 2 did something miraculous and he walked over to the Hot Wheels bin that always has an overflow of tracks and cars, and he started making his own combinations using the set (two lane tracks) and the tracks from previous sets (one lane tracks). The end result was just plain awful but I was overjoyed. He was so proud of himself. I could tell that he felt like he was just as good as his brother and was able to step out of his shadow. 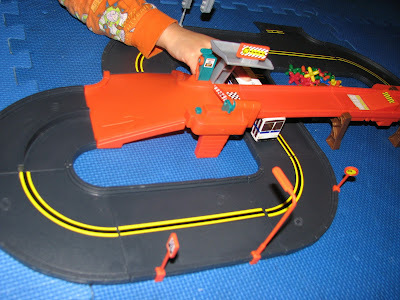 So while the Radical Roadway doesn't directly encourage the building of crazy loops and leaps, it is an excellent starter set for a child who needs a little extra help with building or maybe needs the novelty of something new to get things started. It's a grand wish to all children that the confines of this set will lead the child to bust into a bin full of loose tracks and wild possibilities. Additionally, buying this small set to revive a huge old set but was definitely money well-spent especially because I think Hot Wheels can be a great social toy. They can be the equivalent of boyish monkey bar play ("hey, watch this!" --"oh yeah, watch this!" --repeat loop) The set has a functional launcher, a little gas pump, a ramp and also some button thing where the track pops up and the car could be stopped or fall off the track. Number 1 put an oil can (comes with set) on the track and popped it off with a button. Very cute. Check to see what pieces you have. You might be missing critical pieces and if so, buy the missing parts or get rid of the pieces that are not functional without the critical piece. Put it out of sight for six months before re-introducing as "yours now." Print a picture of one of the intended building ideas and give it to your child with all pieces present when giving the set to him. Explain toyour older child, "this is your little sister's now" and teach the older sibling how to give her little sister time to learn from her mistakes and grow her own ideas. Label some of the pieces or the bin it comes in with younger sibling's name. An older sibling's stronger abilities might discourage your child to pursue an interest if he thinks he will always be 2nd place. Some kids won't care (Venus and Serena?) but some will. Encourage the older sibling to be a good role model and give your younger child an opportunity to pursue these interests away from his older sibling when possible. photo: Hot Wheels Radical Roadway with New York City bus replica and the "blockade" is actually just a bunch of connectors from Roylco Straws & Connectors. Stay tuned for Part 2 of Toys for Overshadowed and Overwhelmed Younger Sibs coming Monday or Tuesday.